Riga, Latvia… 1942 – After World War I, Mihail Karavokiros, who was Greek Orthodox, settled in Riga, Latvia, where he married Feiga Dolgizer, a local Jewish woman. They owned a small candy shop that specialized in Oriental sweets. When the Germans invaded Riga on July 1, 1941, Mihail decided that he would do whatever was necessary to protect his wife’s relatives and Jewish friends. He asked other members of the Greek community in Riga, which included twenty-seven-year-old Valentina Sidiropoulou, for help. Valentina, a Greek-Latvian, used to work at Mihail and Feiga’s candy shop. 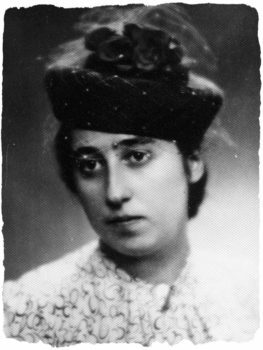 From early 1942, Valentina and her parents hid Mihail and Feiga’s niece, Riva Schaefer, in their home, providing her with food and shelter. Because Valentina and Riva were close in age, they became good friends. On October 28, 1942, Valentina and her parents were arrested for assisting escaped Soviet POWs. Fortunately, Riva was not hiding at their house when the Germans came to arrest the family. Valentina and her parents were sent to Ravensbrück concentration camp. Valentina survived and returned to Riga after the war. Her parents were killed in Ravensbrück. Several other families in the area hid Riva until the Soviet army liberated Riga on October 13, 1944. Riva survived the war. Valentina Sidiropoulou passed away in 2005.